New Kitchen Countertops will make your Seguin kitchen look and feel brand new again. When we build a new home, Kitchen Countertops are just one of the many choices you’re going to need to make during the construction of your home. However, there are also many homeowners who just want to change the countertops they have in their existing kitchen. When it comes to choosing new kitchen countertops there are several things you’ll need to consider in your planning. One of the most important things to keep in mind is your kitchen cabinets because your new kitchen countertops will be placed on top of your existing kitchen cabinets or cupboards. You’ll likely have overhead cabinets as well, so it’s important to try and choose kitchen countertops that will compliment your existing decor. Transforming your current kitchen into your dream kitchen is what Lonestar Home Solutions does best. 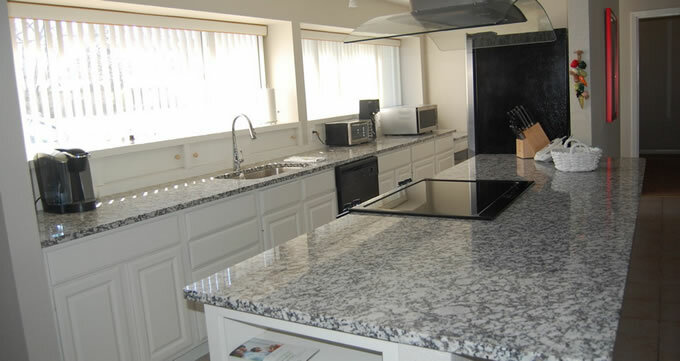 Your new kitchen countertops will improve the look of your kitchen and give you a more enjoyable workspace.